Looking for Canning on Glass Stoves and Ceramic-Top Stoves and Choosing a Canner for Them in 2019? Scroll down this page and follow the links. And if you bring home some fruit or vegetables and want to can, freeze, make jam, salsa or pickles, see this page for simple, reliable, illustrated canning, freezing or preserving directions. There are plenty of other related resources, click on the resources dropdown above. Looking for a canner that can be used on your glass or ceramic stovetop or cooker? Read below to find out why you can't find one, and what the alternatives are! Scroll down this page for more information, and with NO obligation to buy, just click on the links in the Amazon boxes on the left! One of my suppliers asked a stove manufacturer as to why they were unable to find one. The stove manufacturer told they that on a glass/ceramic stove there is a sensor so that the heat (in the glass) cannot go above a certain point thus breaking the top. This sensor does not allow the burner to maintain an even temperature high enough for certain canners (those without flat bottoms, or otherwise not recommended by the manufacturer of the stove) to work safely. By fluctuating the temperature the bacteria is not eliminated in the canning process. Unfortunately this is not something the salesmen will tell the customer when they are buying the stove and probably many of them are unaware of this. A flat-bottomed canner alone would not solve this problem for all stovetops. If yours has the sensor, the heat will still fluctuate and it won't get hot enough to get the big canner full of water to a full boil. If can can confirm with your stove's maker or the store where you bought it that a flat-bottomed canner is okay, there here's a great one, made of stainless steel, so it should last a lifetime - it would also make a great pot to cook applesauce. The pot must not be more than 1 inch wider that the heating element. Another problem is that canners that exceed the burner diameter by more than 1 inch can trap and reflect heat to surfaces of the stove that are not intended to get that hot, and thus crack the stove top. The damage can range from discoloration of white tops to actual burner damage to cracking of the glass tops to fusion of the metal to the glass top. FYI, the typical canner has a bottom diameter of 12 inches. Avoid dragging. Scratching of the stove surface can occur if the canner is slid or pulled across the cooktop. This often happens with large, heavy filled canners, so people need to be careful. Auto-shutoffs prevent sufficient heating with non-flat-bottomed pots and canners . As mentioned above, many of these cooktops have automatic cut-offs on their burners when heat in the glass gets excessive. If that option is built in, and the burner under a canner shuts off during the process time, then the product will be underprocessed and cannot be salvaged as a canned food. This is more of a problem with pots that do not have flat bottoms. The process time must be continuous at the intended temperature, or microorganisms may survive. Also, if the pressure drops quickly, most likely liquid and maybe even food will be lost from the jar (it will spill over from the area of higher pressure inside the jar to the lower pressure now in the canner around the jar). Use flat-bottomed canners. Even if boiling water canning is approved by the manufacturer, it may be necessary to fashion your own canner out of a very large flat-bottomed (smooth) stockpot with a bottom rack inserted. Many canners do not have flat enough bottoms to work well on a smooth cooktop to be able to maintain a full boil over the tops of the jars. The pot used as a canner must also be large enough to have lots of water boiling freely around the jars, and at least 1 inch over the tops of jars. If the canner is too small, then it starts boiling faster than expected and the total required heat the jars receive in the canner even before the process time begins can be too short. Check your stoves manual and directions - Each manufacturer has different conditions for canning. It may be possible on your stove, or it may void the warranty. See the guidance specific to certain stoves! In summary, some smooth cooktop manufacturers say do not can on them, while others who say it is okay add stipulations on the diameter of the canner compared to the diameter of the burner. Boiling water or pressure canners may not be available that meet the maximum diameter pot they allow. All agree that the canners must be flat bottomed. If you have a ceramic or glass stovetop and still have the manual, look it up there. If you will write me with the make, model and and specific warnings in the manual about canning, I'll add that to the bottom of this page, as a resource. This smooth-bottomed canner (below) is recommended for many glass and ceramic stovetops (click on the box to see the reviews on Amazon). Now, having said all this, not ALL glass and ceramic stoves are identical in every respect, so it is always possible that yours is designed differently or behaves differently from the description above. But there are enough stories of cracked stovetops to suggest that regardless, an alternative might be prudent, unless you're sure it is compatible with your stove! So, what can you do? 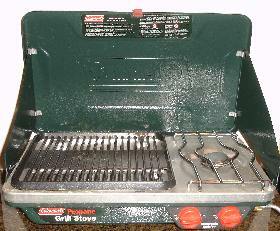 Here is a simple solution: buy a simple and inexpensive propane campstove, an electric burner (shown below) or use an outdoor propane burner and you can use ANY canner with it. Plus, the propane burners may come in handy when you have a lot of cooking to do, during a power outage or when you need and extra burner! One big advantage to using a gas stove outside, is: there's no mess to clean up! I also just received this tip from a visitor: she puts a wire rack (like a cookie rack) on the stove and sets her canner on that. That prevent glass stovetop form heating up too much that it shuts itself off. See this page for more information. Ball now sells an electric canner that does not require a stove. How to choose an electric burner? I look for a robust design and the highest wattage I can find. A single 1000 watt burner doesn't do it. A canner holds around 16 quarts of water, so it takes a lot of heat to get that boiling. I've found that one 1300 watt burner will get the average canner boiling, but it takes a while. So... to speed it up, I got a second burner, put it on the counter, right next to the first and put the canner on top, straddling both burns - and THAT worked like a charm! Gas grills, turkey fryers, large camping stoves all make excellent outdoor alternatives. Of course there are two keys: make sure it has enough oomph (measured in BTU's) and that it is stable and won't tip over. The Camp Chef Explorer 2 (see photo at ri ght and Amazon box below) is nearly perfect! It produces plenty of heat, is waist high, has two burners so you can run two canners or 1 canner and cook on the other! I have one and use it for all my canning. It leaves my stove in the kitchen free for cooking, so I can do twice as much canning in half the time with two canners going. It produces SO much heat, that it can easily keep two canners at a full boil in any weather. And here's how you sell it to your hubby: The legs are removable, so you can easily put it in the trunk of your car and use it for camping and tailgate parties before the football game, or use it as a tabletop stove! And it is perfect for cooking when there is a power outage! I've been using mine for 3 years now. I've seen the 3 burner version is being sold in April - June in COstco. 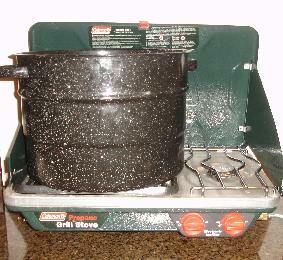 See below for some camping stoves I've tried and used for canning. The outdoor gas stove - great in nice weather, or in bad weather, in an open, but roofed area, like screen porch, open garage, etc.! 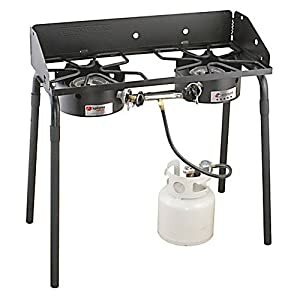 Examples: Bayou Classic Single Gas Burner (click here or scroll down the page) Or the Camp Chef Explorer (click here or see above) which has legs, so there is no bending over. The Coleman camping stove (Coleman 2 Burner Propane Grill /Stove, click here) is perfect for supervised indoor use! It can heat a canner in no time, and folds up neatly for storage. The canner fits easily on the grill portion. This is, in my opinion, the BEST solution. And, of course you can use it for camping and tailgating parties! Scoll down the page to see it. A gas camping burner or countertop propane stoves (click here) with a low, stable profile can be a great spare high-power burner. But if you do a lot of canning, the outdoor cooker (see #1 above) would be cheaper to operate, unless you use the converter to hook up tp a 20 lb tank..
One double burner unit. Click here to see one. Lots of power, but it can be tricky to get some canners (the tall narrow ones) to balance and be stable on them) See examples further down the page. Two 1300 watt burners - if you want to stay indoors - two of these, side by side will work! Click here to see some! Two 1000 watt or greater burners, side by side - since you can move them around it is both a plus and a negative - you can position them to be stable, but perhaps not a close together as the double unit. Fully adjustable cooking power up to 10,000 BTUs per burner. Large control knobs positioned in front for easy access. PerfectFlow(TM) ensures consistent fuel output, regardless of weather, altitude or fuel level. Durable enamel-painted steel case and aluminized cooking surface for easy cleaning. Heavy-duty removable chrome cooking grate and non-stick cast-aluminum grill grate. Folding WindBlock(TM) system doubles as convenient side shelves. Burn time: 4.5 hours on one 16.4-ounce propane cylinders (sold separately) - (Note: these are the green 10 inch tall cylinders so commonly sold, shown attached in the photo of the blue unit). Coleman lifetime limited warranty. Blake: I have an earlier version of this, and as you can see from the photos at left. All versions easily accommodates a large water bath canner OR a pressure canner. I use it for canning, camping, and when the power goes out! Each model puts out 10,000 btu per burner (20,000, total per stove). I recommend the versions withOUT the griddle, as you will be sure the burners are the same height! This extension hose with regulator makes it easy to connect your portable propane stove to a 20 lb propane tank (the same one your outdoor gas grill uses. This makes it MUCH cheaper to use your camping stove as an auxiliary stove to speed your canning! This one has an additional use: I put a standard Weber charcoal smoker on top of it (omitting the smoker's base) and use it as a gas-fired smoker - makes smoking and BBQ EASY! And of course, you can put a large pot on it and use it as a canner, turkey fryer, outdoor stew pot, crawfish boil, etc. Hooks up to any standard propane tank. I still think you'd want two of these, side by side, under the canner. One alone would not produce enough heat to get and keep a canner boiling hard. 1300-watt portable single burner provides extra heating options (part of their ad says "900 watts", but that is an error - it's 1300!) That's enough to keep the canner boiling, but it is slow to heat up. I'm going to get one of these to try - it looks perfect for those long canning days or when you have a lot of cooking to do and not enough burners on your stove. I haven't tried this one, but it looks like the single unit above, plus a smaller 500 watt burner close by it. They look closer together than the Rival double unit below. Guidance Specific to Certain Stoves, Alphabetized by Manufacturer. Amana: A visitor tells me that her Amana manual says "Canning is NOT recommended with any of the Amana smoothtop ranges or cooktops due to the intense heat and large cookware required to can. The heat generated by the canning cookware overheats the elements and the smoothtop of the range. This can cause the smoothtop to crack, cause failure of the heating elements, and can cause damage to the backguard. Damage incurred by canning or attempting to can, using the smoothtop cooktop is not covered under the warranty." "Thank you for contacting Electrolux Major Appliances with your question. The safety switch circuit can easily handle more than the 240 degrees that the water will achieve. Just think about when you deep fry on your range top. The oil temperature reaches 350 or above most of the time. The safety switch will engage sooner if there is air space between the glass and cooking pot because the heat being generated by the element itself will not be transferred into the utensil and food. This is why you want cooking pans and utensils that are absolutely flat and smooth on the bottom , so they can transfer the heat into the food instead of overheating the glass." The rep is correct. I have used pots to heat oil for deep frying on my smooth top range at temperatures of 350 to 370 degrees. I hope this puts to bed the concern about reflected heat tripping the safety sensor and producing questionable canning results. Frigidaire - "I emailed you about my Frigidaire glass top stove. I got a response from the company so thought it might help others out. *Always use flat surface bottomed cookware - medium (gauge) weight is best. *Always start with hot water and a lid on top of the pan. It will take less time for the water to come to a boil. The larger and heavier the pan is, the longer it will take your water to come to a boil. *Use the largest surface element possible. *Make sure the diameter of your pan does not extend over an inch of the surface element. *The maximum weight of the canner and it's contents should not exceed 50 pounds. It is recommended not to use your surface elements continually all day for canning. There is a built-in limiter which allows the element to cycle on and off to keep the glass from getting too hot and causing damage to the cooktop. There are smooth tops on the market today with a variety of element dimensions such as 9 to 12 inches. Also, higher wattage elements are being used for faster boil times. Please let us know if you need any further information or assistance. Thank you for choosing Frigidaire products for your home. Doug Couts Electrolux Technical Assistance "
GE flat top range Model JS998B0H1BB - (the ending BB is for black exterior, SS is for stainless steel exterior, W for white, etc) Serial DG284018Q. The manual says the same thing as the Kenmore model on your web page. You can use large flat bottom canners on it because the boiling water temp will not harm the surrounding cooktop surface. Do not use a large diameter pot (overhangs the burner surface by more than an inch) to boil anything but water though!!!" GE Models JBP60, 65, 75, 76, 77, & 78 - Comments from a visitor on April 07, 2010: "(Glass-top) Can on cooktop only. Pots that extend boyond 1" of the surface unit circle are not recommended for most surface cooking, However, when canning with water-bath or pressure canner, larger-diameter pots may be used. This is because boiling water temperatures (even under pressure) are not harmful to the cooktop surfaces surrounding the surface units. There is a caution to not use these larger pans for frying of boiling anything other than water. They also note that flat-bottomed canners must be used. Thank you for your site!! I was going to buy myself a flat-bottom canner to use on my glass-top stove but may rethink that and go for the propane camp stove instead. I like the idea of being able to set up on the brick patio where there is shade rather than my kitchen which tends to bake in the summer sun." GE PP945BM3BB: "My cooktop is GE PP945BM3BB purchased Nov. 2012.The manual says this about canning: Observe the Following Points in Canning When canning with water-bath or pressure canner, larger-diameter pots may be used. This is because boiling water temperatures(even under pressure) are not harmful to the cooktop surfaces surrounding the surface elements. HOWEVER, DO NOT USE LARGE-DIAMETER CANNERS OR OTHER LARGE-DIAMETER POTS FOR FRYING OR BOILING FOODS OTHER THAN WATER. Most syrup or sauce mixtures--and all types of fruit--cook at temperatures much higher than boiling water. Such temperatures could eventually harm the glass cooktop surfaces. 1. Be sure the canner fits over the center of the surface element. If your cooktop or its location does not allow the canner to be centered on the surface element, use smaller-diameter pots for good canning results. 2. Flat-bottomed canners must be used. Do not use canners with flanged or rippled bottoms(often fount in enamelware) because they don't make enough contact with the surface elements and take a long time to boil water. 3. When canning, use recipes and procedures from reputable sources. Reliable recipes and procedures are available from the manufacturer of your canner; manufacturers of glass jars for canning, such as Ball and Kerr brand; and the United States Department of Agriculture Extension Service. 4. Remember that canning is a process that generates large amounts of steam. To avoid burns from steam or heat, be careful when canning. Note: If your house has low voltage, canning may take longer than expected, even though directions have been carefully followed. The process time will be shortened by: 1) using a pressure canner, and 2) starting with HOT tap water for fastest heating of large quantities of water. CAUTION: Safe canning requires that harmful microorganisms are destroyed and that the jars are sealed completely. *When canning foods in a water-bath canner, a gentle but steady boil must be maintained for the required time. When canning foods in a pressure canner, the pressure must be maintained for the required time. *After you have adjusted the controls, it is very important to make sure the prescribed boil or pressure levels are maintained for the required time. *Since you must make sure to process the canning jars for the prescribed time, with no interruption in processing time, do not can on any cooktop surface element if your canner is not flat. " GE range, model # JBP64BH2WH - a visitor writes: "Regarding using water bath canners on glass and ceramic cooktops, I have a GE range, model # JBP64BH2WH. The manual states: "Home Canning Tips: Be sure the canner is centered over the surface unit. Make sure the canner is flat on the bottom. To prevent burns from steam or heat, use caution when canning. Use recipes and procedures from reputable sources. These are available from manufacturers such as Ball and Kerr and the Department of Agriculture Extension Service. Flat-bottomed canners are recommended. Use of water bath canners with rippled bottoms may extend the time required to bring the water to a boil." Kenmore glass-top stove, model #911.95361592. 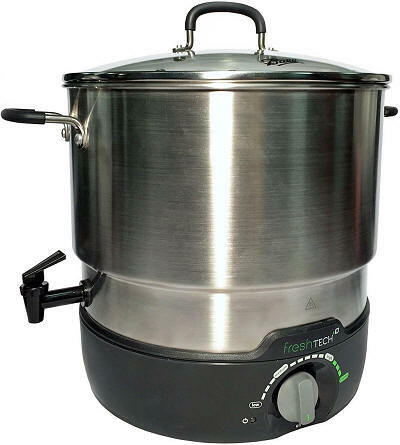 The manual says: "Water-bath or pressure canners and large diameter pots extending more than 1" beyond the edge of the cooktop zones may be used when canning. This is because the temperature needed to boil water is not harmful to the surfaces surrounding the cooktop zones. However, do not use large diameter canners, pots or pans for anything other than boiling water. 1. Be sure the canner is centered over the zones. 2. Make sure the canner is flat on the bottom. 3. Use recipes and procedures from reputable sources. These are available from manufacturers such as Ball and Kerr and the Department of Agriculture Extension Service. 4. Use caution while canning, to prevent burns from steam or heat. GE Induction stovetops, Comments from a visitor on November 06, 2012: "When water bath canning, I use only flat bottom large kettles on my GE induction glass top electric stove. Using a rack with at least 1/2 to 1 inch clearance on the bottom and putting large screw lids around the jars when processing is a cinch. No problem with keeping temperature or rolling boil going. Do not exceed more than 1" than the burner size, also check the watts on each burner. Mine all burn differently with intelligence. MUST use flat bottomed vessels on this type of stove. Purchased through QVC, they have a large selection of completely flat bottomed cookware. Works like a charm. My choice for the large quart size is to use my Weber Genesis grill with a 13,000 watt side burner. It is terrific and outside. Using a traditional large blue water bath canner. In conclusion, for canning 1/2 or 1 pint jars on the stove top is very doable; quart jars should be canned on a powerful gas burner. " Comments from a visitor on July 13, 2011: "Love your site! I've never canned anything but I'm interested in trying. I have a glasstop stove and read your info. Here's what my owner's manual says about canning (Manual covers EER200, EER3000, JBP64, JBP65, JBP66, JBP67, JBP70, JBP78) "Be sure the canner is centered over the surface unit. Make sure the canner is flat on the bottom. Use recipes and procedures from reputable sources...such as Ball and Kerr and Dept of Agruculture Extension Svc. To prevent burns from steam or heat, use caution when canning." In another section is reads: "Every radiant surface unit has a temperature limiter. The temperature limiter protects the glass cooktop from getting too hot. The temperature limiter may cycle the units off for a time if: -the pan boils dry, -the pan bottom is not flat, -the pan is off center, -there is no pan on the unit" I take this to mean to as long as none of these 4 reasons apply, it should maintain the temperature. It does say "the surface unit will cycle on and off to maintain your selected control setting." But this means to me that the temperature shouldn't fluctuate, even if the unit cycles on and off. It should come back on before the temperature drops. I've put everything the manual says in "quotes". The rest is my interpretation. Thanks again for an extremely informative site!" Kitchenaid flat glass stove - Comments from a visitor on October 12, 2009: "I have a KitchenAid flat glass stove and have been canning on it for several years. Yes the heat does cycle on and off but that doesn't prevent me from maintaining a full rolling boil in a large kettle. Mine is pretty flat on the bottom, not a real "canner". I also use a Presto Pressure Canner with little problem. It does need to be watched throughout the process to make sure the pressure stays high enough but I think this would be true of any electric stove. As long as I watch it and make slight adjustments occasionally (2-3 times in a 20 minute canning process) it stays right on pressure. Id look up the manual but I have an enormous drawer full of appliance manuals so...there you go. I did get it at a Sears." Kuhn Rikon Duromatic - Comments from a visitor on February 05, 2011: "For your page on canners for glass and ceramic-top stoves: Kuhn Rikon Duromatic pressure cookers work on all cooking surfaces, including induction cooktops. The brand is pricey, but this cookware will last forever. And they clean so easily. I haven't used their pressure cooker, but their pots are very well made flat-bottom stainless cookware and work great on glass-top stoves. The pressure cooker can be purchased here. Great website! Thanks for all the information. Linda "
LG Electric Range (glass top) model LRE30757sw/sb/st According to the manual: Make sure canner is flat on the bottom. Base must not be more than 1 inch larger than element. Maytag smooth top range, model# MER5775QAW - a visitor writes, "this is what the user's manual says about canning: Canning and Oversize Cookware All canners and large pots must have flat bottoms and must be made from heavy-gauge materials. This is critical on smoothtop surfaces, The base must not be more than 1 inch larger than the element. When canners and pots do not meet these standards, cooking times may be longer, and cooktops may be damaged. Some canners are designed with smaller bases for use on smoothtop surfaces. When canning, use the High heat setting only until the water comes to a boil or pressure is reached in the canner. Reduce to the lowest heat setting that maintains the boil or pressure, If the heat is not turned down, the cooktop may be damaged. " Maytag, Model MER5770BAW Electric Range: - "Do not use non-flat specialty items that are oversized or uneven such as round bottom woks, rippled bottom and/or oversized canners and griddles." Baking rack between the surface and the canner: "Never place a trivet or wok ring between the surface and pan. These items can mark or etch the top." . Whirlpool glass top stove, model WFE361LVQ, a visitor writes on June 24, 2014: " Finally called Whirlpool directly regarding using a water bath canner. They tell me that the stove can be used for water bath canning. The canner cannot extend more than one inch over the element. The store cannot be used with a pressure canner. AND the water bath canner when full cannot exceed 30 pounds. So, after trying to days to find out what I could or could not do, I finally have guidance directly from the manufacturer. Will have to go to a smaller canner (of course one with a flat bottom), but will be able to continue to can on this darn stove." Whirlpool Gold GR399LXGB ceramic top range - Comments from a visitor on August 11, 2009: "Regarding flat cooktops: I have yet to can on it. I just received my Ball Basic Canning Kit and unfortunately, it has a ridged bottom pan. The site I purchased it from didn't mention that. I may try it anyway, just to see. Here is what my stove manual says about canning (note the last section about having a "canning kit for coil models" installed): Home canning information To protect your range: Use flat-bottomed canners on all types of cooktops, especially ceramic glass. Canners with rippled or ridged bottoms do not allow good contact with the surface. Center the canner over the largest surface cooking area. Do not extend more than one inch outside the surface cooking area. Large diameter canners/pans, if not centered correctly, trap heat and can cause damage to the cooktop. Do not place your canner on two surface cooking areas at the same time. The type of material the canner is made of determines the length of heating time. Refer to the Characteristics of cookware materials chart later in this section for more information. When canning for long periods of time, allow elements and the surrounding surfaces to cool down. 1" 1" Surface Pan cooking area Alternate use of the surface cooking areas between batches or prepare small batches at a time. Start with hot water, cover with a lid, and bring to a boil; then reduce heat to maintain a boil or required pressure levels in a pressure canner. On coil element model, keep your reflector bowls clean so that they will always reflect heat well. For up-to-date information on canning, contact your local U.S. Government Agricultural Department Extension Office or companies who manufacture home canning products. Optional canning kit (Coil element model) Most water-bath or pressure canners have large diameters. If you do canning with them at high heat settings for long periods of time, you can shorten the life of regular coil elements. This can also damage the cooktop. If you plan to use the cooktop for canning, we recommend the installation of a Canning Kit. Order the kit (Part No. 242905) from your Whirlpool dealer or authorized Whirlpool service company." Whirlpool Model #RF374PXDN1 - Comments from a visitor on September 02, 2010: "This is what my user manual says for Whirlpool Model #RF374PXDN1 - Home canning information Pan Surface unit l. Use the largest surface unit for best results. Also, use a canner/pan which can be centered over the surface unit. 2. Start with hot water. This reduces the time the control is set on high. Reduce heat setting to lowest position needed to keep water boiling. 3. Refer to your canner manual for specific instructions. Cookware tips l.Select a pan that is about the same size as the surface unit. NOTE: For best results and greater energy efficiency, use only flat-bottomed cookware that makes good contact with the surface units. Cookware with rounded, warped, ribbed (such as some porcelain enamelware), or dented bottoms could cause uneven heating and poor cooking results. You can, however, use the newer cookware available with slightly indented bottoms or very small expansion channels. This cookware is specially designed to provide the good contact needed for best cooking results. Also, woks, canners, and teakettles with flat bottoms suitable for use on your cooktop are now available in most stores that sell housewares. 1. The pan should have straight sides and a tight-fitting lid. 2. Choose medium to heavy gauge (thickness) pans that are fairly lightweight. 3. The pan material (metal or glass) affects how fast heat transfers from the surface unit through the pan material and how evenly heat spreads over the pan bottom. Choose pans that provide the best cooking results. 4. Handles should be made of sturdy, heat resistant material and be securely attached to the pan. 5. With your hand, feel the bottom of your pans while they are cool for nicks and scratches. Nicks and scratches on pan bottoms will scratch the ceramic glass cooktop. 6. Make sure bottoms of pans are clean and dry before using on cooktop. 7. Avoid spillovers on cooktop. Use pans with tall sides. 8. Do not cook food directly on cooktop. NOTE: Do not leave an empty utensil, or one which has boiled dry, on a hot surface unit. The utensil could overheat and damage the utensil or surface unit. " Canning can be performed on a glass smooth top cooking surface. When canning for long periods, alternate the use of surface cooking areas or elements between batches. This allows time for the most recently used areas to cool. Center the canner on the largest cooking area or element. On electric cooktops, canners should not extend more than 1/2" (1.3 cm) beyond the cooking area or element. Do not place canner on 2 surface cooking areas or elements at the same time. On ceramic glass models, use only flat-bottomed canners to avoid damage to the cooktop and elements. For more information, contact your local agricultural extension office, or refer to the USDA Home Canning Guides. Companies that manufacture home canning products can also offer assistance. Also, I know this will make you laugh, but thank you so much for your website, especially the pages on how to choose a canner, and the very basic how to as well. I kept thinking "If I put the open jar in a water bath..." which made zero sense...Now I think I can handle some of this. Okay, you can stop laughing now. " NEW: A German-made electric canner that does not require a stove. This Weck Electric Water Bath Canner. There is no way of knowing when, or even if, this will be sold in the U.S. We're just waiting for the distributor to confirm when they get it back in stock. Click on the Amazon box at left to verify availability. 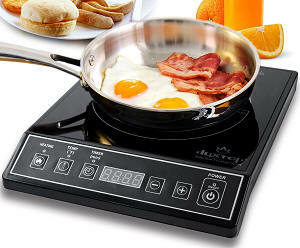 Advantages: operates on it's own, standalone on the countertop, does not require a stove!